Last night, just as I was nodding off on the floor while putting the kids to sleep (other parents, tell me I’m not alone), the two of them asked for home lunch for today. Buddy required I make him two spam musubis and Baby Girl wanted mac and cheese. 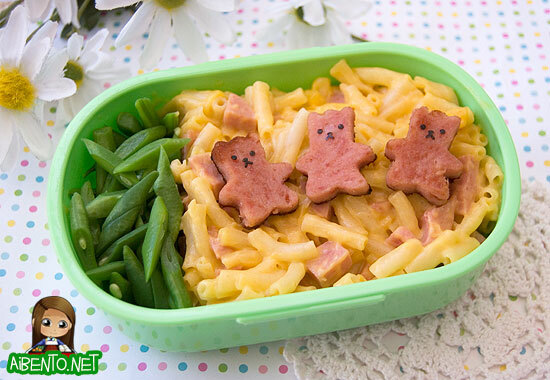 This morning as I rushed to make them their simple, but sadly non-bento lunches, I decided that I liked Easy Mac enough to make it for my own lunch. 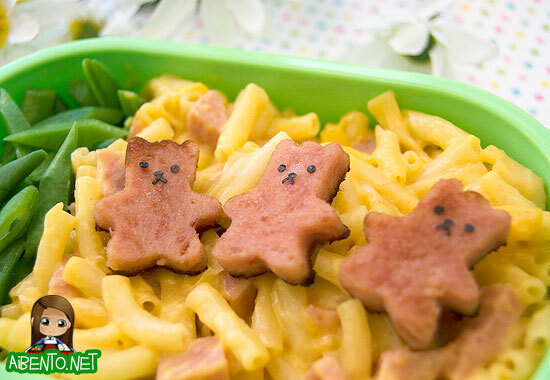 Since I’d already opened a can of Spam for his musubis and chopped some up for her mac and cheese, I just used another packet and two slices of Spam for my lunch. I used a little bear cutter that I got at Marukai once and never used until today. I have my little bear punch, so I used that for the faces. If you don’t have such a punch, it’s not really necessary, since you can tell they’re bears anyway. This Wilton mini cookie cutter set has a little bear that you could use. It’s a lot easier to cut out Spam when it’s uncooked and then fry them up when they’re already shaped. If you fry them first and then cut them, you run the risk of tearing the crusty part off and making funky looking bears. Here are the three bears close up. As you can tell, I kind of over browned them on the bottom! For the Spam that goes into the mac and cheese, I usually just cut it up and toss it in “raw” and let the heat of the noodles cook it. However, when I was eating this lunch today, I noticed that the uncooked spam didn’t have much taste while the fried bears had a very salty taste. Not sure if it was because of the residual sauce from the musubis or what, but the fried tasted way better! The green beans are really fresh. The kids noticed that Mr. Pikko’s bean bush out front had beans, so they picked them all and put them in the fridge. This morning I just boiled them in the frying pan that I used to fry the bears and french cut them. It was a nice, easy way to add greens and they were so sweet and fresh! Having just a handful of beans is really good too because I usually waste a lot of the beans whenever I buy a bag at the market and those things are expensive! Hope you like the bears! Buy that mini cookie cutter set and you can do all kinds of fun shapes.